It was a painful walk, as much mentally as it was physically. 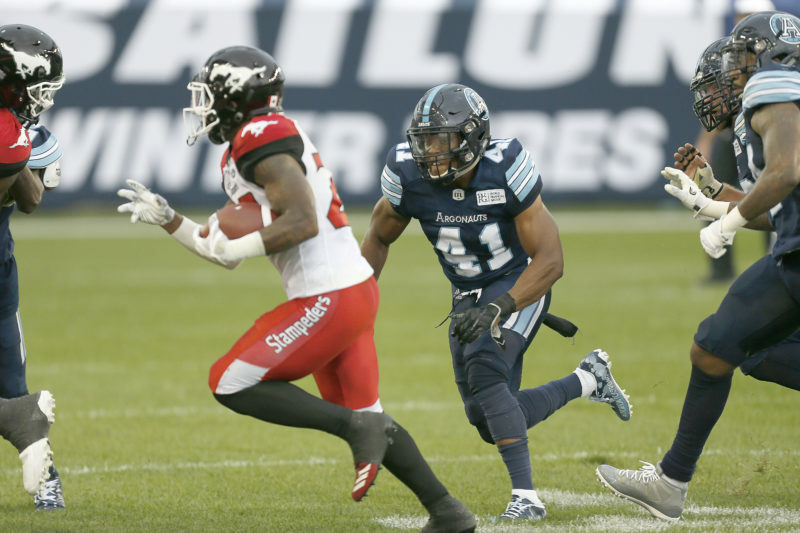 As the crowd was leaving BMO Field after the home opener, most Argo fans were talking about either the injury to Ricky Ray or the lop-sided loss to Calgary. Nakas Onyeka’s attention was on his knee. 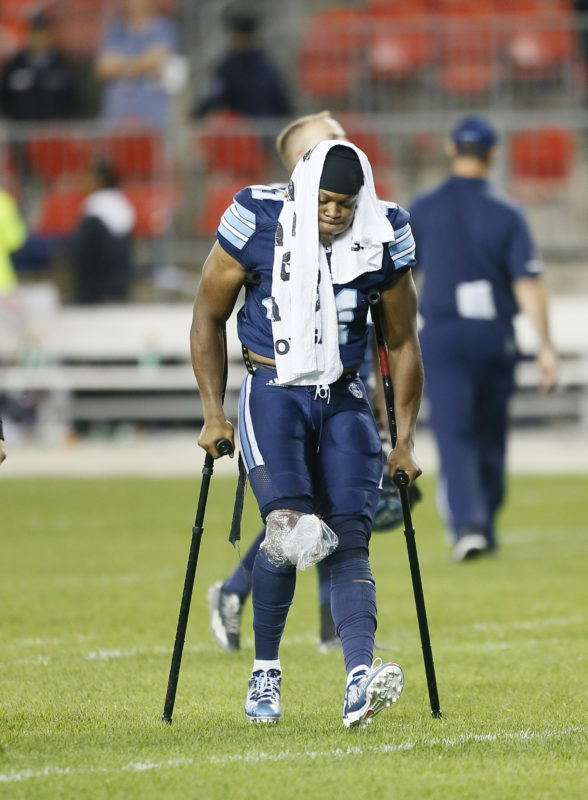 Awkwardly hobbling to the Argos locker room with the aid of crutches at game’s end, the second-year linebacker knew this was no minor setback. It wasn’t. It was the ACL that was torn, meaning he’d miss the rest of the season as the average recovery period for that injury is eight or nine months. Onyeka did what every athlete does after an injury like that, he played the “what if” game. What if I took a different angle? What if I got off my block sooner? What if…? What if…? 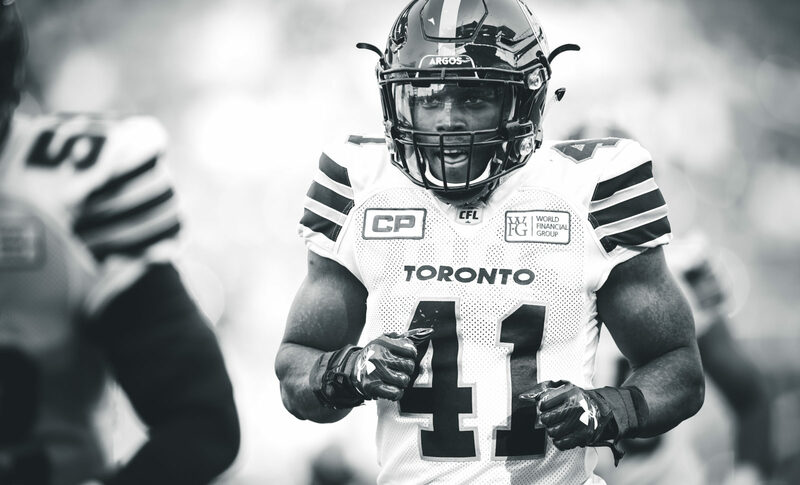 To add to the frustration, it was the first time the Brampton native would miss a game in his football career. Even worse, the injury came in the game he saw significant reps on defence for the first time. To his credit, Onyeka has been able to find a positive in such a challenging situation. OUA fans saw what Onyeka was all about as a member of the Laurier Golden Hawks. If you ever lost sight of the football, all you had to do was look for the purple No. 11 because there was little doubt that jersey would be near it. In his final year he was named the top defensive player in the OUA, averaging over six solo tackles a game, adding 5.5 sacks and 15 tackles for a loss in just eight games. Many observers felt the Argos stole Onyeka as the first pick of the fifth round of the 2017 CFL Draft. He started to show how good he could be at the CFL level with a solid training camp a year ago. Last year must have felt a lot longer because he didn’t get to play. Again, he used the time away from the field to learn, seeing how other injured teammates like Ray, Marcus Ball and Bear Woods worked through their injuries. Now he wants to share some of those habits with younger athletes. A year ago, Onyeka was invited to coach at a skills camp hosted by Ottawa Redblacks defensive back Chris Ackie, another Laurier product. He’s got a good crew assembled, including Ackie, Calgary receiver Jordan Brescasin, Saskatchewan QB Brandon Bridge, BC receiver Shaq Johnson, his cousin Godfrey Onyeka, a defensive back from Edmonton, and Argo teammates Troy Davis and Chris Kolankowski among others. Participating in last year’s camp has motivated Onyeka to branch out. His goal is to also hold a camp in Nigeria. Both of his parents were born there and it’s a chance to combine football and family. Argonauts.ca asked the obvious question, how big is football in Nigeria right now? Back to his ‘other’ career, Onyeka should be ready to play by the beginning of May, perfect timing for a repeat performance of his standout camp of a year ago. This time he’ll be back under the direction of new Head Coach/Defensive Coordinator Cory Chamblin, with whom he worked in the Grey Cup season of 2017. The linebacker is pumped up about the return of his former coach. Learning from Chamblin while instructing younger players. Nakas Onyeka is setting a great example of how to be a student and a teacher at the same time. Here’s a link to find out more information about the camp, which runs during the March break.